This is the winter of soups for me! I have been working on developing so many different soups that can be made in the slow cooker and ready as soon as we walk in the door for those cold winter nights . It feels like you can't really call yourself a real cook until you've perfected your "soup", you know? Every good cook in my life has a family famous soup or stew. Soon I'll have mine! This one could be a contender. 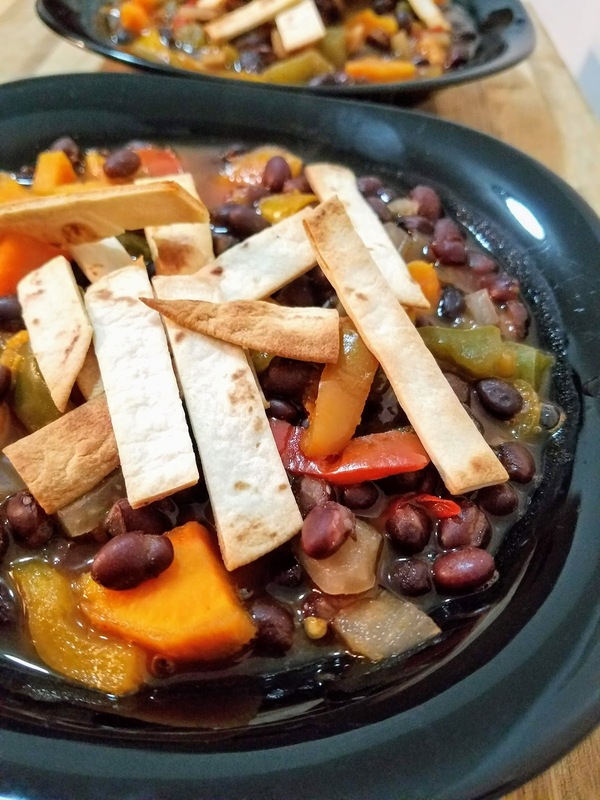 It's a spicy black bean soup topped with crispy tortilla strips. 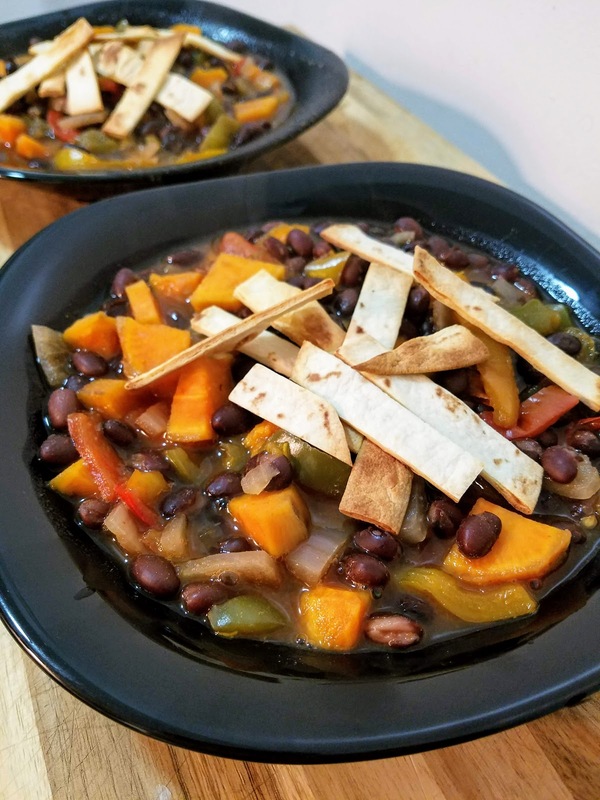 If you used to love Chicken Tortilla Soup as a meat-eater, this will be your go-to as a vegan. 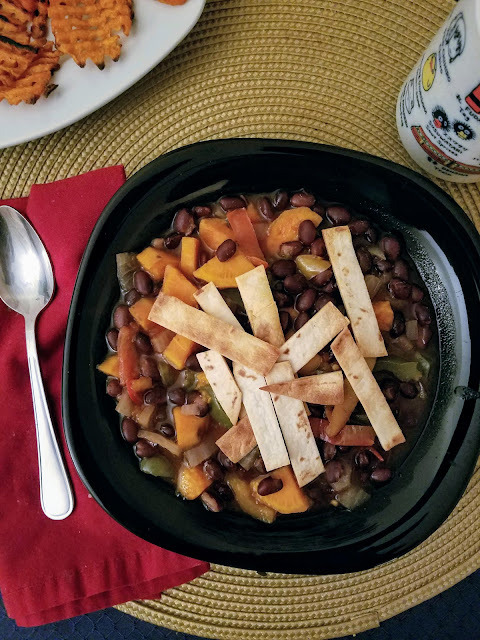 It's easy to have the ingredients on hand-- can of black beans, frozen mixed pepper strips, a sweet potato, red onion, veggie stock-- for whenever you need an easy set-it-and-forget-it dinner that is a crowd pleaser. The tortilla strips take less than 10 minutes in the oven for a fast and worthy topping. They bring good texture and are a fun cracker alternative for kids (and adults!). 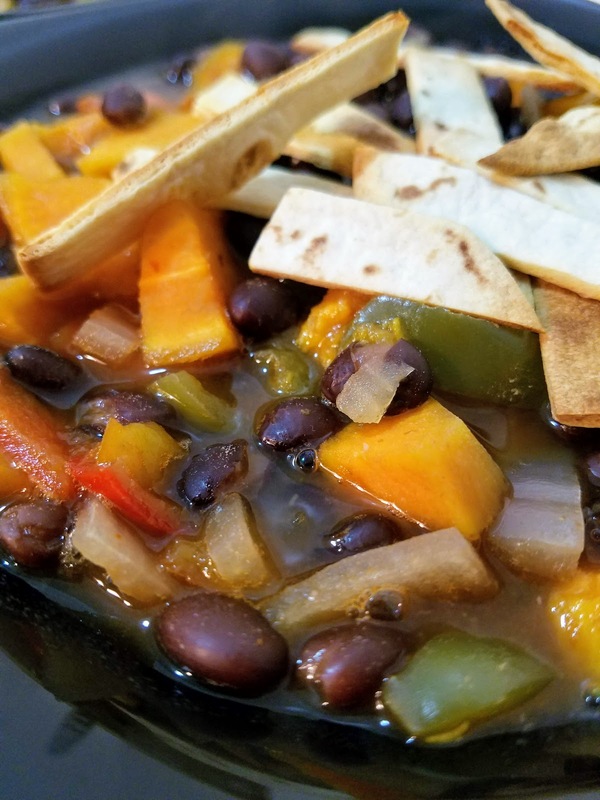 Add black beans, pepper strips, sweet potato, red onion, tomato paste, vegetable stock, paprika, garlic powder, crushed red pepper flakes, and a pinch of salt in a slow cooker. Set for 6 hours on low. 30 minutes before it's ready, preheat oven to 350 and place tortilla strips on a baking sheet. Bake strips for 10 minutes or until they are crisp and crunchy (they will crisp up as they cool as well). 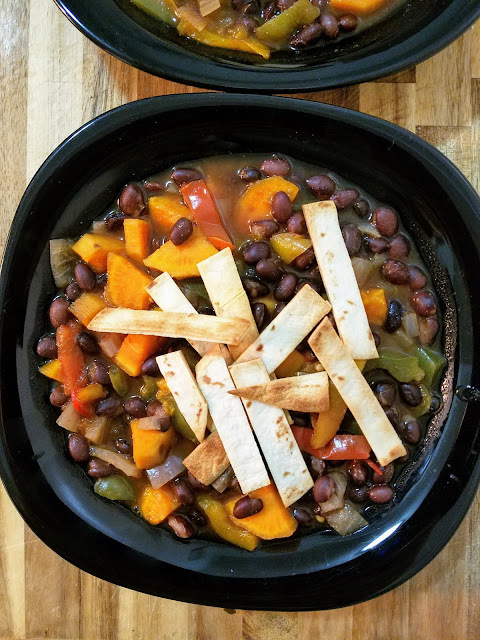 Meanwhile, uncover the soup and turn the slow cooker on high for the last 20-30 minutes. Serve immediately topped with crunchy tortilla strips.